The heart muscle is supplied blood through the coronary arteries. 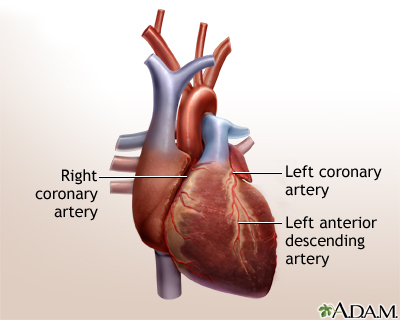 The left coronary artery supplies blood to the left ventricle. The right coronary artery supplies blood to the right ventricle. Updated by: Mary C. Mancini, MD, PhD, Director, Cardiothoracic Surgery, Christus Highland Medical Center, Shreveport, LA. Review provided by VeriMed Healthcare Network. Also reviewed by David Zieve, MD, MHA, Medical Director, Brenda Conaway, Editorial Director, and the A.D.A.M. Editorial team.